Lightweight - 6.7 oz to be exact! It's a Bird.... It's a T-Rex.... It's Chicklet! "Ok, so really, I'm a bird. But my ancestors were DINOSAURS! (Theropods, like the T-Rex, to be exact.) Most people don't know this about birds, but now YOU do! I love to learn fun facts about animals and explore the outdoors looking for bugs. Does that sound like a "Little" you know? A fun fact about birds is that we have hollow bones. That's what makes us so light that we can fly. I can't fly, but I AM very lightweight! .....and I come in 3 beautiful colors, to make your "Little Someone" happy! 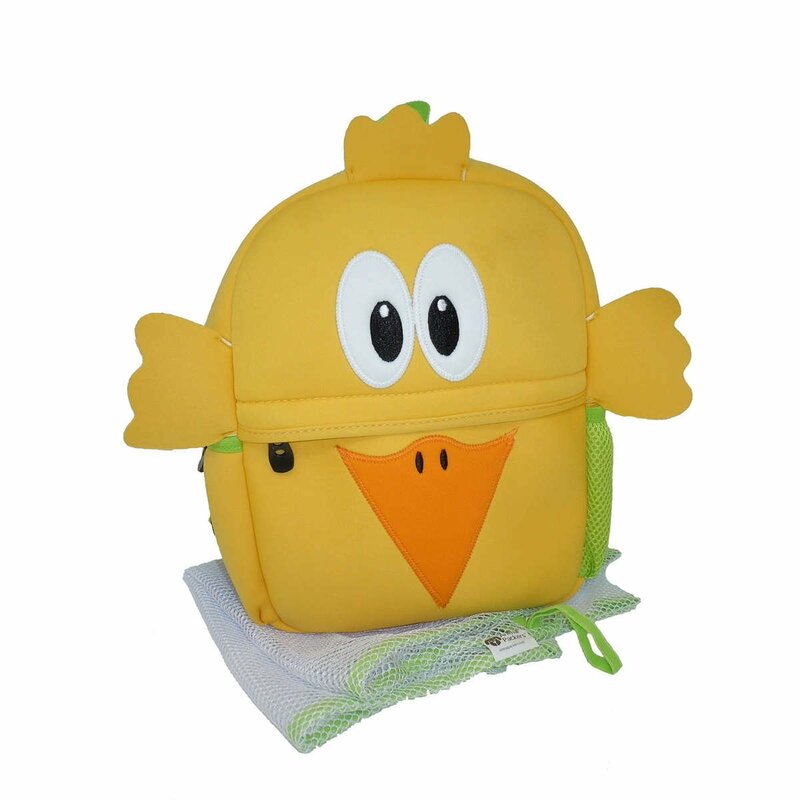 Chicklet is the perfect "Little" Backpack for school, travel and fun outings. Your "Little" will feel "Big" when she packs Chicklet herself and carries her own stuff. She won't even notice that she's carrying Chicklet, because its so lightweight. Chicklet comes with a Removable Name Tag that is great for going to school or day-care, but easily comes off when it's time for travel. Chicklet is both lightweight and made with the proper dimensions for Littles' backs. The adjustable straps make it easy to get the perfect fit. Chicklet is shipped in a Re-usable, Color-able box. Your Little can color and decorate the box and use it as Chicklet's nest or use it for other treasures. 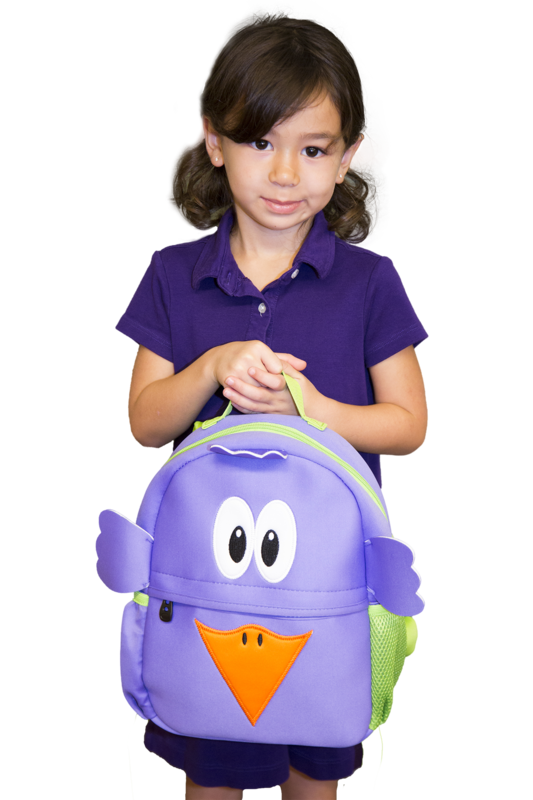 Padded, adjustable shoulder straps allow Chicklet to fit properly and comfortably. The fabric we put on the back of the straps helps prevent slipping as your Little moves around. Quick, easy access to the most important things: FOOD!! Use Chicklet s zippered front pouch for snacks and his 2 side pockets for drinks. Fully-lined, bright green interior (we call in "Animal Packers Green") to make finding crayons, snuggle-buddies and other essentials easier for Littles. Washable materials AND the included "Care Bag" make keeping Chicklet Clean a cinch! When it's time for a 'bath,' just put Chicklet in the care bag and wash in cold water. Chicklet has passed the tests to be BPA, PVC and Phthalate free. I come in 3 bright, beautiful colors (but birds come in 15 different colors!) I wonder what color a T-Rex would like best?" 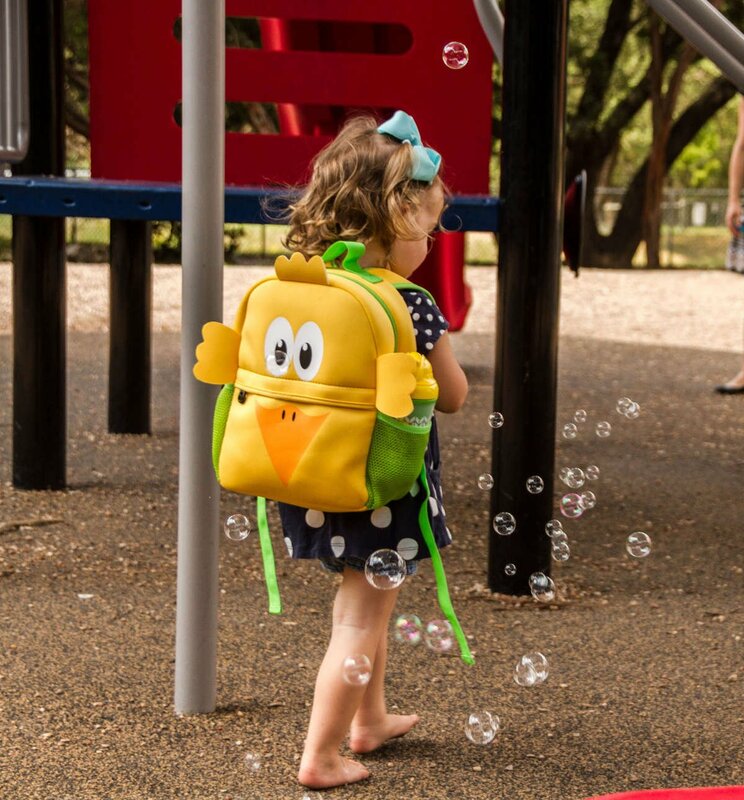 Chickelt is the perfect "Little" Backpack for school, travel and fun outings. Your "Little" will feel "Big" when she packs Chicklet herself and carries her own stuff. She won't even notice that she's carrying Chicklet, because its so lightweight. Cute and GREAT on our trip! This backpack looks so cute on my son (age 2!) He loved carrying it for our vacation. He felt like such a big boy!